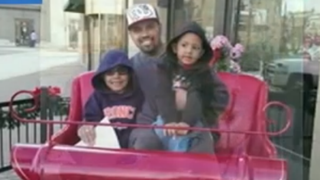 Rene Lima-Marin with his sons, Justus, 7, and Josiah 4. Rene Lima-Marin robbed two video stores 15 years ago, when he was just 19. He walked into the stores with an unloaded rifle and demanded money. He admitted to the crime and was sentenced to what he and his lawyer believed was a 16-year-sentence. After 10 years of serving time, Lima-Marin was set free. He got married, fathered two children and purchased a home. He swore he would never do anything to jeopardize the new life he had created. Then, earlier this year, the life he had built came crumbling down when a judge, citing a clerical error, sent him back to prison to finish a 98-year sentence. "Ninety-eight years for what?" he told Fox 31 Denver. "People have raped, molested kids, taken lives and [gotten] 15, 20, 25 years. And I made a mistake and tried to steal some money, and I am given my entire life in prison? It just doesn't make sense." According to the news station, the court system made an error, and therefore Lima-Marin's lawyer was given the wrong information about his case. Lima-Marin claims that his lawyer instructed him not to appeal what he initially believed was a lengthy sentence because he was already in the best-case scenario, which was for all of his charges to run concurrently, meaning that the longest sentence he could be given was 16 years. Per his lawyer's advice, he withdrew his appeal for a shorter sentence. But the lawyer's information, and the court file sent to the Department of Corrections indicating his sentences, were both wrong. Lima-Marin's sentence was to run back-to-back, totaling more than 90 years. During his initial incarceration, Lima-Marin was a model prisoner, never receiving even one write-up. "It's that everyday, happy, white-picket-fence type of life," he told the news station about the life he'd created since being set free. He was free for almost six years before he was told of the court's mistake. "I would have never had a wife. I would have never had children. I would have never bought a house. I would have never done any of those things," he told Fox 31. "But I did those because you let me out. And now they are being punished for something they had absolutely nothing to do with," he said to the news station, referring to his family. Because Lima-Marin had a prior criminal history that included thefts committed as a juvenile, his case was aggressively prosecuted under a Colorado program called COP (for "chronic-offender program"). The program, which no longer exists, was supposed to be used for offenders with an extensive criminal history. Lima-Marin was found guilty of three counts of armed robbery—each of which carried a penalty of 10 years, for a total of 30 years. If he were found guilty of that crime today, it would likely net him anywhere from four to 16 years, the news station reports. In addition, because he moved three people who were in the front of the store to the back, he was charged with and found guilty of three counts of kidnapping, which carried 16 years per count. He was also given multiple years for two counts of burglary, Fox 31 reports. According to the news station, "Lima-Marin won't even be eligible for parole until the year 2054—40 years from now—when he's 75." "I did something wrong. I acknowledge the fact I did something wrong. I take responsibility for the fact I did something wrong. But I also believe I completed the punishment, the just punishment for the crime," he says. Read more at Fox 31 Denver.